As families gather for the Thanksgiving holidays, most are planning elaborate meals complete with turkey and all the trimmings. Safety in the kitchen is essential as meal preparation mistakes can increase the risk of food borne illness. Each year about one in every six Americans contracts a food borne illness, leading to 128,000 hospitalizations and 3,000 deaths, according to the U.S. Centers for Disease Control and Prevention. Holiday meals, particularly those featuring turkey, have been linked to outbreaks of bacterial diseases caused by salmonella and campylobacter, and even E. coli. Extra care in the kitchen can easily minimize those risks and ensure a happy and healthy family Thanksgiving. "We do see an increase in outbreaks around the holidays, and you also hear about it more, " said Dr. Ben Chapman, food-safety specialist and assistant professor of family and consumer sciences at North Carolina State University. "It doesn't have to be a turkey dinner either. There are lots of risks involved It has more to do with the process of making a large meal and the timing, where you are trying to make sure everything is ready at the same time." One of the biggest health risks when cooking for the holidays is that of cross contamination or simply undercooking. Dr. Chapman said this can especially be problematic, and even dangerous, if family cooks use color, or a myth that the turkey is ready when the juices run clear, to determine that a turkey has been cooked properly. Turkey is ready for consumption only after it has been cooked to a temperature of 165 degrees. The best way to check is by using a meat thermometer and checking in multiple spots to ensure the turkey has been cooked thoroughly. Dr. Chapman said this also works well by helping to prevent dry and overcooked turkey. Temperature may vary slightly for ham, though many come pre-cooked and ready to eat. They don't tend to have the same risk of cross contamination as compared to turkey. "A lot of people are not used to handling this type of product. They're doing it once a year," Dr. Chapman said, noting that many may be cooking a turkey for the first time, or may not be accustomed to preparing large meals. Another turkey preparation myth largely perpetrated by the fact that Thanksgiving is a tradition-based holiday, is that the bird should be washed. Dr. Chapman advises skipping this step unless it is necessary to rinse blood or feathers from a free range turkey. He noted that placing a turkey under vigorously running water can prompt the spread of potentially dangerous pathogens up to three feet away from the sink. 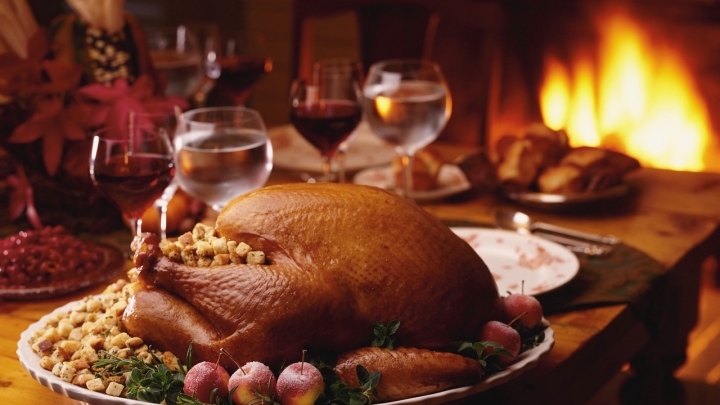 "There is a common myth that (washing the turkey) does something for contamination control. This actually adds to the problem," said Dr. Chapman said. "If you do wash the turkey with a dish cloth, treat it like toxic waste and put it directly into the wash."
Also ensure that you use two sets of cooking utensils -- one for turkey that has not been cooked and another for fully cooked turkey. With a large family dinner, there's the risk of leaving out leftovers for too long. Many families leave out a buffet of food for hours, allowing members to get seconds, wrap up doggie bags, to feed late-arriving relatives, or simply because they're exhausted from cooking and too stuffed to begin putting food away. "People need to make sure to put stuff in the refrigerator," Dr. Chapman said. "People really bend the rules a little more this time of year." Thawing - Turkeys that are being thawed should be kept at a safe temperature since as it begins to defrost bacteria that was present can begin to multiply. The safest way to thaw a turkey is in the refrigerator, in cold water or in the microwave. The "danger zone" for bacteria is between 40 and 140 degrees so check the temperature to ensure it hasn't reached this unsafe zone. Preparation - As Dr. Chapman mentioned, bacteria on raw poultry can contaminate other surfaces and utensils during preparation. Ensure that these areas are cleaned thoroughly before using the same area for other foods as the bacteria can be transferred to other foods. Always wash your hands, counters and utensils after touching raw turkey before starting on other foods. The stuffing - It is safest to cook stuffing outside turkey such as in its own casserole dish, which also helps ensure uniform cooking. If dressing is cooked inside the turkey, add it just before cooking and use a food thermometer to ensure the stuffing reaches an internal temperature of at least 165 degrees. Bacteria can survive in stuffing that has not reached this temperature, which could result in food borne illness. Cooking - When cooking a turkey, do not set the oven lower than 325 degrees, and make sure it is completely thawed. Turkey should be cooked with the breast side up on a flat wire rack inside a roasting pan that is two inches to two and a half inches deep. Though cooking times will vary, ensure that the center of the stuffing and the meaty portions of the breast, thigh and wing reach an internal temperature of 165 degrees. Let the turkey stand for 20 minutes before removing stuffing and carving the meat. Cleaning and sanitizing may seem similar but in fact the two processes are very different. When it's time to clean up while making and after completion of your holiday meal, make sure you're thorough and don't take shortcuts. Cleaning involves removing dirt and grime, while sanitizing is the process of removing pathogens. Soap and water will get your kitchen clean, but it's not enough to get rid of pathogens. "When you're brining a turkey and putting it in a pan, it can splash," Dr. Chapman said. "You should wash (the counter) surface with soap and water, then use a bleach solution. You especially need to do this if you're preparing other foods at the same time. You need to break that pathogen chain along the way." Take time to sanitize each time following the handling of a risky food such as turkey. That means your kitchen likely will need to be sanitized several times during the preparation process -- not just after completing the holiday meal cooking. North Carolina State University, "Food-Safety Expert Can Offer Tips For Thanksgiving" U.S. Centers for Disease Control and Prevention, "It's Turkey Time: Safely Prepare Your Holiday Meal"